The dining experience invites guests on a journey to explore different perspectives of local food through a unique cocktail tasting format at our host venue, ZUGORAMA by V-ZUG. See more details of each event below and be sure to get your tickets soon! Asia Miles members can earn 1 mile for every HK$2 spent on ticketing. Please enter your membership number and ensure you submit the same name registered to your Asia Miles account when checking out on our ticketing platform. join chefs Asher Goldstein of Francis (T.Dining Hong Kong Top 20 Best Restaurant 2019) and Michael Chan of Sushi Tsubomi as they collaborate on a small bites menu fusing Middle Eastern and Japanese influences to tell a story of Hong Kong like never before. One of the dishes Goldstein will bring to the table is Iberico pork with tomato and chilli, inspired by his early memories of jaunts around Hong Kong's local wet markets—pork is not widely eaten in his native Tel Aviv, so the chef had decided to create this dish to cement his place in his adopted city. Meanwhile, Chan decided to use snapper to feature in his signature of sliced snapper with Kumamoto tomato giso sauce—the fish being ubiquitous on Hong Kong dinner tables and, for him, full of childhood memories. See more menu details and purchase tickets below. On the second night, join chef Nicholas Chew of Bibo, chef Saito Chu of John Anthony, and pastry chef Joanna Yuen of Nobu as they collaborate on a small bites menu fusing French, Chinese and Japanese influences—inspired by the many meals locals tend to eat in a day—to tell a story of Hong Kong like never before. The menu will be divided into categories such as "breakfast" and "afternoon tea" to feature familiar dishes such as pineapple bun, turnip cake and egg tarts—but not as you know them. 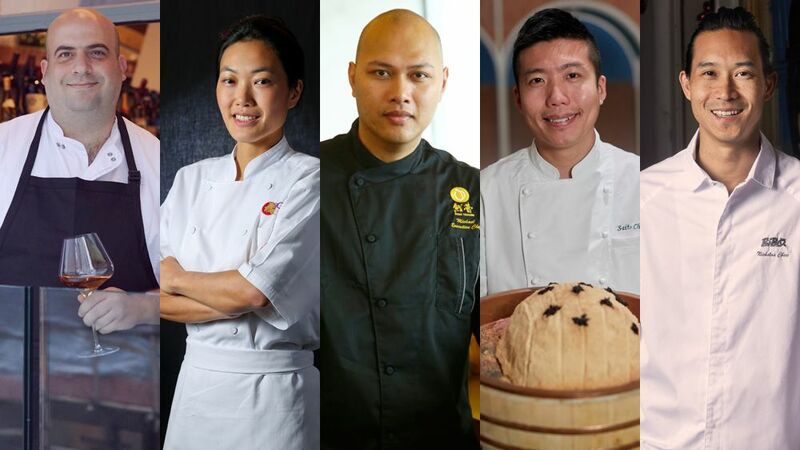 On the third and final night, each chef will prepare two highlights from their respective menus and present an epic dining experience to pay homage to their memories of Hong Kong. Stay tuned for the dish highlights!